Nicole Parker is a passionate youth and community advocate. In 2009 she graduated from Aquinas College with a dual degree in Community Leadership and Political Science. After graduating Nicole spent years in higher education specializing in work centered on diversity, cultural competency, leadership development, and student of color retention based programming to assist in college success. 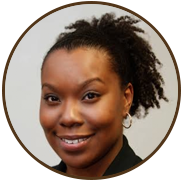 She also has experience working in the area of pre-college programs doing college access workshops, conferences, and summer bridge programs which included being the former Assistant Director of Student Development for the Entrada Scholars Program at Calvin College. In 2016, Nicole Graduated from George Mason University with a Masters in Social Entrepreneurship where her research focused on culture, policy, and innovation in communities of color. Since graduating Nicole has co-founded along with her sister Alisa Parker, ANP Creatives Consulting a social innovation firm dedicated to helping clients execute their vision of impactful social change. Her passion for community and empowering others to reach their full potential has driven Nicole to remain extremely active and involved in both the midwest region and the DMV area. Nicole is committed to ensuring individuals in her hometown have access to key resources and opportunities to have successful thriving lives!